With Williamsport crowded with automobiles congesting every available parking space, large forces of policemen last night prohibited any additional traffic through the town. From early morning to late at night, the Williamsport pike was jammed with traffic bearing persons anxious to witness the flood spectacle. At the request of Mayor Richard G. Hawken, the regular force of town officers was augmented by four State policemen and four officers of the Hagerstown department. The officers directed traffic and patrolled the town to prevent looting. R. M. Mills, watchman at the Pennsylvania Railroad crossing on Virginia avenue, counted 1,020 motor cars from 1:05 to 1:50 yesterday afternoon. He said the traffic flow was the greatest in eight years. A member of the family of John N. Bower, Halfway, reported 576 cars passing the home from 1:30 to 2 o'clock. 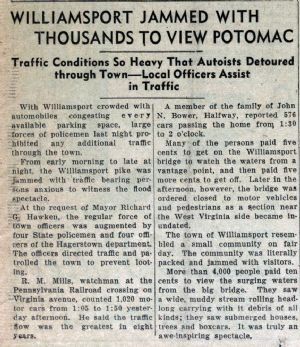 Many of the persons paid five cents to get on the Williamsport bridge to watch the waters from a vantage point, and then paid five more cents to get off. Later in the afternoon, however, the bridge was ordered closed to motor vehicles and pedestrians as a section near the West Virginia side became inundated. The town of Williamsport resembled a small community on fair day. The community was literally packed and jammed with visitors. More than 4,000 people paid ten cents to view the surging waters from the big bridge. They saw a wide, muddy stream rolling headlong carrying with it debris of all kinds; they saw submerged houses, trees and boxcars. It was truly an awe-inspiring spectacle.